Swiss gear specialist Christ & Heiri relies on FANUC-controlled MZ gear hobbing machines to deliver maximum quality. Task: To reequip a factory with gear hobbing machines capable of meeting Christ & Heiri’s extremely high standards and guaranteeing maximum customer satisfaction. The machines require a control that is easy to program and ideally suited to sophisticated gear, sprocket and worm machining processes. Solution: Install FANUC-controlled Monnier + Zahner machines to produce tens of millions gear wheels, sprockets and worms in diameters ranging from 0.5 to 40 mm every year. Result: The company’s 24 Monnier + Zahner gear hobbing machines run round the clock, seven days a week. 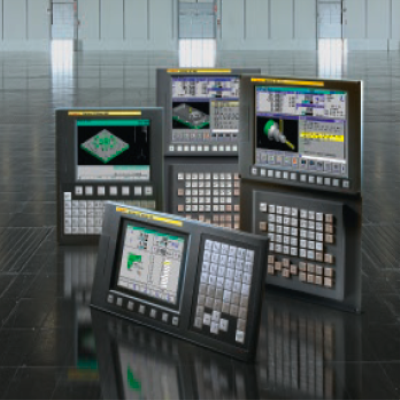 Programming is straightforward thanks to Monnier + Zahner’s increasing use of FANUC controls with Panel i to complement the CNC kernel. This enabled the company to use its own PC-based software to develop a unique dialogue interface that is touch-screen operated. Another key function to benefit production is FANUC’s Electronic Gear Box (EGB), which precisely angles the tool and workpiece in a highly-precise transformation ratio. Monnier + Zahner machines equipped with FANUC CNCs. The ultimate in CNC precision for sophisticated gear, sprocket and worm machining processes. FANUC’s Electronic Gear Box (EGB) precisely angles the tool and workpiece. Anyone supplying the automobile industry must guarantee the highest quality of components and prompt delivery. A showcase company in this regard is the gear specialist Christ & Heiri, guaranteeing utmost customer satisfaction due to its vast expertise and FANUC-controlled gear hobbing machines from Monnier + Zahner. Christ & Heiri AG in Selzach near Solothurn (Switzerland) is an exemplary company, right down to the details. Modern, automated gear hobbing machines are lined up in a row on a spotless workshop floor. Chips and lubricants are disposed of by means of a duct system in the facility ceiling, and centrally processed. Modern measuring and inspection equipment ensures that the gear wheels and worms – meaning the shafts equipped with one or more screw threads – are delivered in optimal quality to the customer. For Managing Director Arno Heiri, this high quality and prompt delivery are two core elements that are responsible for the success of his company: "We have had very close, longstanding relationships to our customers, above all from the watchmaking and automobile industry." Just how much customers appreciate the cooperation with Christ & Heiri has been manifest in the past few years. Because in June 2010, the company's production facility burned completely to the ground. In this, the building was only eighteen months old and equipped to the latest standards. It was a devastating blow to the then 59-year-old entrepreneur and his team. The fact that Arno Heiri was able to rebuild his plant in the same place and in the same way was largely attributable to his customers. They assured him that they wanted to continue working with Christ & Heiri. His employees also felt a responsibility towards their boss, and they put all their efforts into rebuilding the company. After one year, it was done, and today the production in the new facility with the same employees is running at full speed again. "Full capacity", Arno Heiri is able to report. Tens of millions of gear wheels leave the production line annually, from the smallest parts – e.g. wheels only 0.5 mm in diameter, but having eight cogs – up to sprockets and worms 40 mm in diameter. Whilst the small and smallest parts are primarily intended for the watchmaking industry, the larger products mostly end up in electrical motors for the automobile industry. Because in modern vehicles, there are many small actuator motors these days – for central locking, controlling the air-conditioning unit, for electric windows, for adjusting the exterior mirrors, for the sunroof, the boot locking mechanism, for seat adjustment and much more. There is a commensurately high demand for gearbox components such as gear wheels and worms. Depending upon the component, orders at Christ & Heiri range from small series of up to 1000 parts, all the way to large series from 5-6 million units per year. For Christ & Heiri, meeting high precision parameters is no problem. Amongst the twenty-five employees of this company steeped in tradition – it was founded 65 years ago – a vast amount of expertise has accumulated. The Head of Production, Pascal Zimmermann, explains: "The experience of our workers, in combination with our state-of-the-art machinery, puts us in the position to handle the highest quality requirements with process reliability." The management places the greatest importance in process reliability. After all, the 24 gear hobbing machines from Monnier + Zahner are running round the clock, seven days a week. All the automobile parts are produced on the MZ120 and MZ 130 gear hobbing and worm milling machines and the Duplex M644CNC high-production double-spindle worm milling machine. Monnier + Zahner AG from Safnern near Biel, Switzerland, enjoys Arno Heiri's complete trust: "Our partnership has existed for 10 years, and we have never been disappointed. The FANUC-controlled MZ machines are high-precision and reliable. If we have any service request, the employees are on the spot immediately. That is why Monnier + Zahner has become the main supplier of our CNC-controlled gear hobbing machines." The traditional Swiss company began in 1964 with the engineering of machines for watch case fabrication, later specialised in machines for the medical and dental industry, and since 1995, has become one of the world's leading manufacturers of gear hobbing, threading and worm milling machines. "We already began working with CNC technology in 1984", explains Roland Wälti, Managing Director at Monnier + Zahner AG. "But since entering the thread and worm milling business, and later gear hobbing, we have been relying completely on CNC controls – always with our partner in this field, FANUC. Together we have developed several solutions that have contributed to our market position today. Mr Zimmermann, Head of Production, attests to the high performance, reliability and easy operation of the MZ machines. In particular, he emphasises the flexibility of the MZ120 and MZ130 gear hobbing machines, with which worms can be milled and gear wheels can be hobbed. "This means we are not solely dependent upon manufacturing worms, and we can manage the capacity of our machines more effectively. Machine supplier Roland Wälti adds: "At the company Christ & Heiri, the MZ are mostly used for large series. Due to their versatility, however, they are also popular among smaller supplier companies who are required to deliver many different small series. With these machines, they can also perform several hobbing operations on one component in sequence, even alternating with cylindrical and worm gear milling – without repositioning the work piece or changing the heads." The application and programming of all Monnier + Zahner machines is straightforward. This is essentially due to the user-friendly interface developed by the machine manufacturer. "FANUC offers great support in this respect", emphasises Martin Wälti, Head of the Software Department at Monnier + Zahner. "In the past, we used the FANUC Macro Executor and the FANUC Picture function for this. Today we are increasingly using the FANUC controls that have a separate FANUC industrial PC (Panel i) to complement the CNC kernel. This enables us to use our own PC-based software to develop a very special dialogue interface that is touch-screen operated." Martin Wälti also points out a key function in the FANUC control, "Electronic Gear Box (EGB)", which is instrumental in gear manufacturing. He explains: "In a gear-cutting operation, the tool and the work piece, as in a gear box, must be angled at a highly-precise transformation ratio. For this purpose, FANUC offers the integrated EGB function, with which we communicate via our dialogue interface." In addition, on the latest machines, Monnier + Zahner use the integrated FANUC safety function, Dual Check Safety, which protects the operator and makes mechanical safety installations unnecessary. For example, it enables a more flexible set-up of the machine, as slow axis movements that do not endanger the operator are allowed when the door is open. Software Specialist Martin Wälti lauds the close cooperation with the control specialists in the Swiss FANUC subsidiary: "We have always received fast, expert support there. Whether it was commissioning or required axis optimisation, or even for the selection of the suitable FANUC CNC for our various machines." The software and parameter adaptation of the particular control to the machine was no problem, even for custom machinery of which Monnier + Zahner AG partly produced only one unit. Martin Wälti attributes this to the straightforward and easy-to-understand layout of the FANUC CNC. Furthermore, he features the reliability, the easy maintenance and above all, the worldwide availability of service from FANUC, "which is especially important for a relatively small, yet globally active machine tool manufacturer." As regards CNC and drive technology, Christ & Heiri is also extremely satisfied. After all, there was never any problem with a control in all those years. In 1964, Eugen Monnier and Robert Zahner established a company in the Safnern-Moos industrial park which up to 1972 was dedicated to the engineering of machines for watch case fabrication. The watchmaking downturn caused a shift of production to machines for the manufacturing of medical implants. In this field, Monnier + Zahner AG has achieved a worldwide leading position. Other important mainstays are grinding machines for dental drills and cutters, along with machines for the production of worms and gears for gearbox manufacturers and suppliers to the automotive industry. This also includes special machines that are built according to customer requirements. Since 2007, the company Lambert-Wahli AG has also been part of the Monnier + Zahner AG group. Today the team comprises 65 employees, including twelve trainees. Monnier + Zahner produces between 65 and 100 machines per year.